This is Tarantino’s eighth film (KILL BILL is considered to be one film) and, like most of his other work, THE HATEFUL EIGHT is an acquired taste. It’s bloody, violent, shocking, full of colourful language and larger than life. In fact, this film really is larger than most. It was shot on 65 mm film stock using Ultra Panavision 70 lenses, which is a format that hasn’t been used in almost 50 years. (The last film to be shot in Ultra Panavision 70 was KHARTOUM, in 1966.) The result is an aspect ratio of 2.76:1, which is almost 20 percent wider than today’s widescreen cinema standard. If that sounds exciting, calm yourself down. We’re not going to see the film in that format in Hong Kong because we don’t have a cinema (anymore) that can accommodate it. Instead, we’re getting the digital version. Asia’s World City indeed! 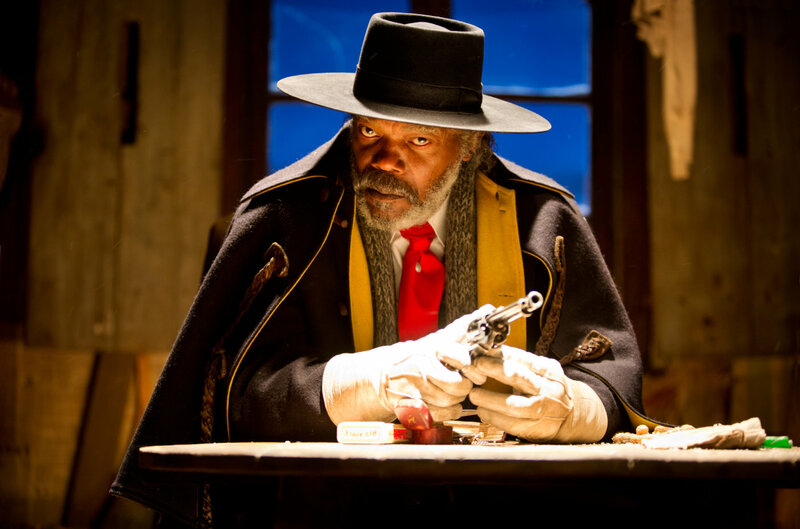 THE HATEFUL EIGHT is replete with references to other films. If you’re a fan of the old Westerns, you’ll love the opening credits. Tarantino uses a Ponderosa-style font done up in primary colours. It’s very reminiscent of films like HOW THE WEST WAS WON (1962), which also had some scenes shot in Ultra Panavision. Characters and costumes, too, seem to be lifted from other Western films. Kurt Russell’s character, John Ruth, could have easily been played by John Wayne back in the ’60s, while Samuel L. Jackson’s character, Major Marquis Warren, is dressed like a stylish version of Joe/Manco/Blondie (all played by Clint Eastwood) in the DOLLARS trilogy (A FISTFUL OF DOLLARS, FOR A FEW DOLLARS MORE and THE GOOD, THE BAD AND THE UGLY) of the mid-1960s. Even the name Marquis Warren is borrowed. The original Marquis Warren directed a number of Hollywood Westerns in the 1950s, in addition to developing the long-running TV series, GUNSMOKE. Now for the story. John Ruth (Russell, who also appeared in Tarantino’s GRINDHOUSE/DEATH PROOF) is a grizzled hangman in post-Civil War Wyoming who is bringing outlaw Daisy Domergue (Jennifer Jason Leigh, sounding an awful lot like “Ma Baker” in Boney M’s 1977 disco classic of the same name) to face justice at the end of a rope in Red Rock. His six-horse stagecoach is racing across the foothills to beat a snowstorm that is nipping at its back wheels when the pair come across Major Marquis Warren (Jackson, Tarantino’s DJANGO UNCHAINED, INGLOURIOUS BASTERDS, KILL BILL, JACKIE BROWN and PULP FICTION). Warren is also a bounty hunter, who was bringing three very dead men back to Red Rock with him when his horse succumbed to the cold. Ruth lets Warren and his cargo come on board and the coach continues on its way as the storm gets closer. Very quickly they come across another traveller who is stranded in the snow – Chris Mannix (Walton Goggins, DJANGO UNCHAINED), who claims to be on his way to Red Rock to take up his new position as the town’s sheriff. Naturally, Ruth and Warren are suspicious of Mannix but they agree to let him come on board too. As the storm bears down on them, they decide to take refuge a few miles short of the town at Minnie’s Haberdashery. Minnie, though, is nowhere to be found. Instead, they find Bob, “the Mexican” (Mexican actor Demian Bechir), who tells the men that Minnie went to Red Rock to see her mother and left the store in his care. Three other men are there too, presumably waiting out the storm – Englishman Oswaldo Mobray (Tim Roth, PULP FICTION; RESERVOIR DOGS), who tells the men that he’s Red Rock’s hangman, cowpuncher Joe Gage (Michael Madsen, KILL BILL; RESERVOIR DOGS), and Confederate General Sandy Smithers (Bruce Dern, DJANGO UNCHAINED; NEBRASKA). With all the characters in place, the rest of the film becomes a cross between an Agatha Christie parlour mystery and the movie THE THING (1982) — yes, THE THING! — as the blizzard rages outside. Now here’s where the ultra-wide angle lens business fails. What’s the point when all the action is contained in one room? It would seem that we have two self-indulgent filmmakers who are up for a slew of awards this year, the other one being Alejandro Gonzalez Inarritu (THE REVENANT). When you go see a Tarantino film, you know to expect a lot of violence so why are so many people complaining about the violence in this film? If you don’t want to watch violence, go see CAROL instead. I’m not a big fan of violent films either but Tarantino does it so well. There is humour in the absurdity of watching someone getting shot in the face, in the foot, or in their privates. There is also humour when Daisy gets used as a punching bag because we know she’ll get her revenge soon enough and it will be far worse than what is being dished out to her. For Daisy, though, until that moment comes, she also has to endure the indignity of having every liquid that gets tossed, spat out or sprayed ending up all over her face. It doesn’t take too long before she takes on the appearance of Regan in THE EXORCIST. Similarly, when you go see a Tarantino film, you know that he’s also going to push the boundaries on acceptable language. This time it’s the “N” word, which is liberally used throughout the film. The director has fought back against his critics, saying that “that was the word that people used back then”. While we may cringe at the first time we hear the word, I think he’s right. It would be ridiculous if the script called for the actors to use a politically correct version of the term. There aren’t too many filmmakers around these days whose work is scrutinised as closely as Tarantino’s. The man is immensely talented and this film proves it so once again. Fans will not be disappointed.